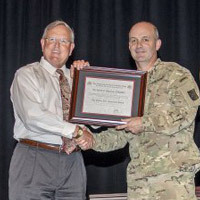 Dave Anderson, faculty advisor and international relations faculty member at Webster's Fort Leavenworth campus location, received his 20th Silver Pen award during a ceremony by the U.S. Army Command and General Staff College honoring faculty authors. "I feel a professional obligation to contribute to the body of knowledge," he said. "Research and publishing helps me further develop in my field. It nurtures the development of professional expertise, it helps maintain and/or advance currency and relevancy in my academic field. I enjoy the research process...scratching the itch of intellectual curiosity, possibly promoting some professional debate among colleagues at other institutions and in the operational force." Read the full story at the U.S. Army site. Webster Vienna professors Elina Brutschin and Samuel R. Schubert published their latest article, "Hot Tempers, and High Stakes: Geopolitics and Geoeconomics of the Arctic" in the June edition of the renown peer-reviewed journal Energy Research & Social Science (ERSS). They assess different geopolitical and geoeconomic perspectives before "examining whether the Arctic's special characteristics make circumpolar state cooperation more or less likely in an economic and politically sustainable fashion." Their research ultimately suggests that "economic interests drive military activity in the Arctic rather than purely classical expansionist explanations." Read more at Webster Vienna or in the full article via Science Direct. Jodie Borgerding, instruction and liaison librarian, attended National Library Legislative Day in Washington, D.C., May 1-3. As president of the Missouri Library Association, Borgerding led a contingent of Missouri librarians to Capitol Hill. 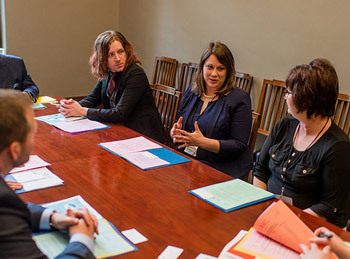 They met with Senate and House staffers to advocate for library funding, “net neutrality” and broadband access, Freedom of Information Act/copyright reform, and other legislative issues that could potentially impact libraries across the country. Cindy Yamnitz, assistive technology coordinator in the Academic Resource Center, was invited to participate on the Disabilities Services Professional Panel at the Missouri AHEAD (MOAHEAD) Spring Conference. She is one of five panelists invited to discuss disability services at higher education institutions. MOAHEAD is a state-wide organization focused on strengthening the professionalism, expertise and competency of those working with students with disabilities at institutions of higher education across the state of Missouri by providing professional development and networking opportunities. MOAHEAD is an affiliate chapter of the Association on Higher Education and Disability. The conference is being held at the University of Missouri - Columbia on June 2-3, 2016. 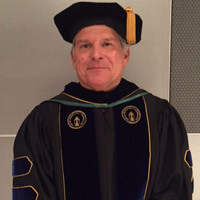 Jeffrey Ferezan, adjunct faculty member in Management for Webster's George Herbert Walker School of Business & Technology, was named a Robert L. Bailey Award winner during Franklin University’s 152nd commencement ceremony on May 22 in Columbus, Ohio. Ferezan taught master’s-level managerial psychology this year at Franklin and has a long history with the university, previously serving as the program chair for Business Administration and director of the Graduate School of Business, a predecessor of the Ross College of Business. Selected from nominations by students, the Bailey Award recognizes faculty who had a significant influence on students' education experience. "Ferezan helps his students grow not only academically, but professionally and personally as well," one nominator wrote.